Finely chop (by hand or in a food processor) the cabbage, onions, kale and fennel and place into a large mixing bowl. Grate the carrots and beetroot into the bowl. Note that other types of cabbage/root vegetables can be used to adapt the dish to what you have around. Make the dressing by combining the Greek yoghurt with the Dijon mustard and the juice and zest of 1 lemon. Season with salt and pepper to taste. Chop all the fresh herbs (different herbs can be substituted but you want around 3/4 of a cup in total) and mix them into the yoghurt dressing. Pour the dressing onto the vegetables and mix well. Note: this will keep in the fridge for several days if it is stored in a covered/airtight container. 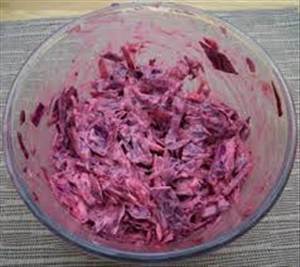 There are 67 calories in 1 serving of Colourful Coleslaw. Calorie Breakdown: 12% fat, 70% carbs, 19% prot.